SKU: 8907043187359 Stock: Not Available Category: Rosewood Products. 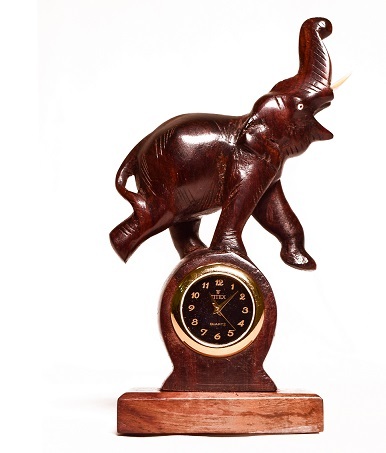 R/W Carved T/U Elephant With Clock.rosewood carved elephant sculpture,rosewood carved elephant idol,trunk up elephant,The mighty Indian elephant is the symbol of power, strength, fertility and royalty. Apart from its aesthetic value as an exotic objet d art, the ornate elephant is viewed as a lucky charm. The attractive sculpture is sculpted from the finest rosewood by deft artisans. The magnificence of the wooden sculpture is enhanced by the lovely brass inlay work that showcases the wealth of ancient Indian artistry.the exquisitely carved Elephant is a favourite of interior decorators and vastu designers. It makes a wonderful home d?cor accessory and even makes a great wedding present or corporate gift.